Soften the butter in a microwave safe bowl until malleable, 10-15 seconds. Using a fork, mash in and combine blue cheese and garlic until fully mixed. Spoon the butter onto tin foil, doing your best to reshape it to resemble a stick of butter. Roll and place in the refrigerator for about 10 minutes and remove 5 minutes before serving. Preheat the oven to 415° F. Remove steak from the fridge 30 minutes before cooking, this is to bring the steak to room temperature and ensure your cooking times are more accurate. Season both sides liberally with salt and pepper. Add the olive oil and plain butter to an oven safe cast iron skillet and turn up high, allow the skillet to become hot first. Place the ribeye face down and sear undisturbed for 2 minutes. Flip the ribeye and sear for an additional 2 minutes. This will give your steak a nice seared edge. Add rosemary and then transfer your skillet directly to the oven. [WARNING] skillet may be hot, handle with oven mitts. For rare, bake for 4-5 minutes. Medium rare, 5-6 minutes. Medium, 6-7 minutes. Remember, depending on the size of the steak, the more or less time it will take. This recipe is ideal for a 20-24 ounce bone-in ribeye. 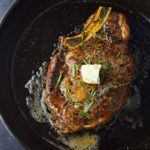 Drizzle ribeye with melted rosemary butter from the skillet. This is to add rosemary flavor to the steak. Transfer ribeye from the skillet and set on a plate, top with a slice of blue cheese butter and let sit for 5 minutes before serving. This is important to bring your steak to its final serving temperature.